Hadoop is a juggernaut when it comes to big data. Intel is a juggernaut when it comes to data center infrastructure. Its decision to enter into the open source software market is a big one for the chip company, for the Hadoop ecosystem and for the myriad startups playing in this space. As the Apache Hadoop ecosystem extends into new markets and sees new use cases with security and compliance challenges, the benefits of processing sensitive and legally protected data with Hadoop must be coupled with protection for private information that limits performance impact. Project Rhino is our open source effort to enhance the existing data protection capabilities of the Hadoop ecosystem to address these challenges, and contribute the code back to Apache. We basically said, let’s take a clean sheet approach to the problem and design a solution that eliminated the use of shared secrets, used modern-day cryptography, and that made it user friendly. The result is a system that has the security that is far better than even using those hardware tokens and so forth, but yet has the ease of use of Facebook Connect. He’s suggesting to use public key cryptography to solve the problem that hackers gain access to accounts through breaking into the service provider’s servers, instead of guessing the passwords. Just replacing the authentication mechanism won’t fully solve the problem, you will also have to secure the end to end chain of events of the service to ensure that a hacker who’s got privileged access isn’t able to see-all and do-all in the service with god-like powers. But a public key based approach can also help with that. Over the last several years, there has been a major evolution in how applications are being built with new underlying technologies, application architectures and data formats, but have application scanners evolved with them? These new technologies have grown at such a fast rate, we haven’t been able to keep up at either end. On one end, developers aren’t able to build these new applications securely because they are up against deadlines from the business and delivering on new technologies. And on the other end, web application scanners were architected in the golden days of web application security when almost all web applications were static and relatively simple HTML pages. 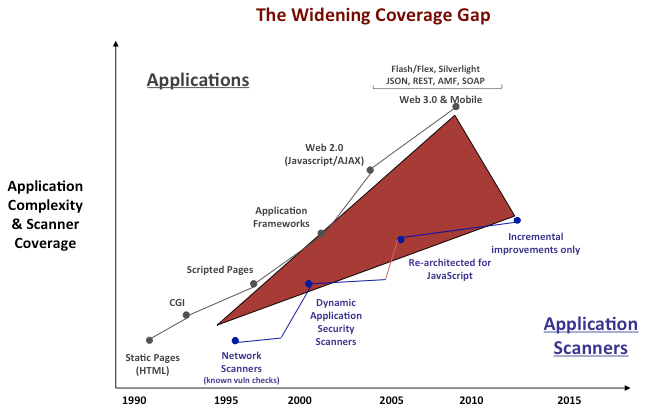 The widening coverage gap of application security scanners. Are younger people less aware of online security risks, or do they simply prefer to take more risks with their personal information? That’s one of the questions raised by the findings of our recent poll of 2,129 U.S. adults (aged 18 and over) by Harris Interactive. The new study, undertaken by Harris Interactive for ESET, questioned more than 2000 people online from August 27–29, 2012 on their use of passwords. Passwords remain by far the primary method of authentication on the internet, and remain fundamental to our security and privacy. My friend and colleague Stephen Cobb has shared some interesting survey data in a blog article indicating that the age group between 18 and 34 is less likely than older groups to use complex passwords or even to use different passwords according to the sensitivity of the context. You have a secret that can ruin your life. It’s not a well-kept secret, either. Just a simple string of characters—maybe six of them if you’re careless, 16 if you’re cautious—that can reveal everything about you. Soon on this blog: why rich people use better passwords than the young folks. Lately, I have been spending my time preparing and finally taking the GIAC Information Security Professional (GISP) and the Certified Information Systems Security Professional (CISSP) certification exams. I passed both. The exams are very different, though they cover the same material. Still considering what’s right for me… suggestions, anyone? Homomorphic encryption: computation on encrypted databases without ever decrypting them. An important step that should eventually allow even the most privacy focused institutions off-loading some of their data processing into public clouds. via Alice and Bob in Cipherspace.